The Nebraska Statehouse in Lincoln. 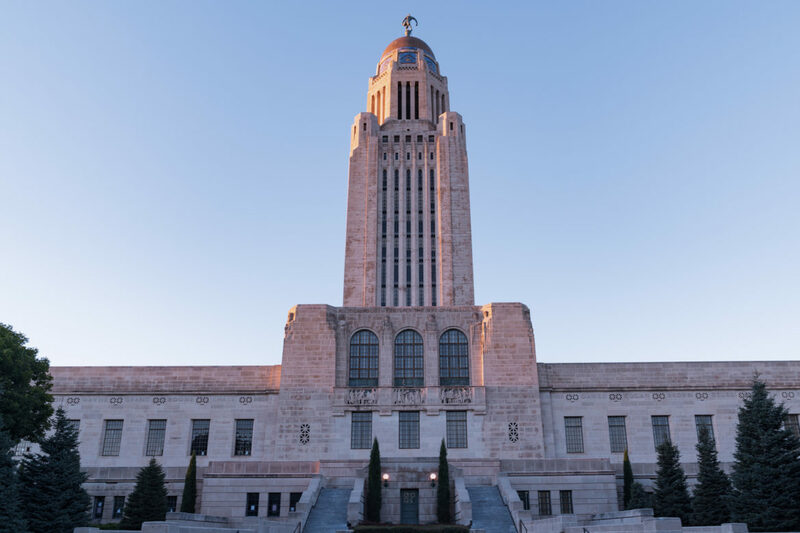 A bill to merge the Nebraska Energy Office into the state’s Department of Environmental Quality could impede efforts to move the state toward the use of cleaner and less energy, according to some clean energy advocates in the state. The Department of Environmental Quality is responsible for enforcing state laws regarding air and water quality and waste management. Nebraska Gov. Pete Ricketts proposed the merger. At his request, Sen. Dan Hughes introduced the bill. Combining the 15-employee Energy Office with the 217-employee Department of Environmental Quality would create several efficiencies, according to Jim Macy, the department’s director, who testified at a committee hearing last week. A merger would hasten the Energy Office’s move from paper to electronic documentation and processing, as the DEQ has done, according to Macy. Secondly, he said a combined office would allow elimination of duplicate support staff providing financial management, human resources, information technology support and records management. Thirdly, he said a conjoined office could “leverage expertise,” meaning that the know-how of one office could be applied to both. Since both agencies provide low-interest loans, and often to the same applicants, he said, one department’s expertise could serve both. Ken Winston, policy and outreach director for Nebraska Interfaith Power & Light, isn’t buying it. Mike O’Hara, a member of the Nebraska Sierra Club, also dismissed the proposal. David Bracht, who directed the Energy Office for about three years until he left last August, endorsed folding his former agency in with Nebraska’s environmental regulators. The agencies’ missions are not so clear-cut and distinct, said Bracht, whose departure preceded the governor’s proposal to combine the agencies. He said enforcement actions and incentives already coexist within both agencies. The DEQ, for example, offers enticements to nudge school districts toward less-polluting school buses. And the Energy Office has a role in enforcing compliance with the state’s energy code. But more broadly, Bracht said he sees merit in the governor’s vision. Several years ago, according to Bracht, the state’s Energy Office — part of the governor’s staff — had about 50 employees scattered among several offices across the state. Now, many of the office’s employees are approaching retirement, a fact that he said presents management challenges. He said he’s confident that the Energy Office can carry on with all of its current work. In addition to distributing federal energy grants and operating a $47 million revolving energy-efficiency loan fund, Bracht said his office snagged a couple of competitive grants. It received $300,000 to help small-town wastewater treatment plants to become more efficient. And the federal transportation department gave the Energy Office $2.3 million to get more high-ethanol fuel pumps installed in the state. Senate Bill 1 would require state agencies to cut 30 percent of regulations within three years, or eliminate two for every new one implemented.